This is the sort of location that lends itself to broad rhetorical flourishes. It’s tempting to say that a setting like this one, on a rocky hillside above the sheltered Anse Louis, on the west side of Mahé island, renders architects and designers just about redundant. Of course it’s not quite literally true that we would happily sleep in a tent, or a trailer, or a cardboard box, to be faced with such a view. 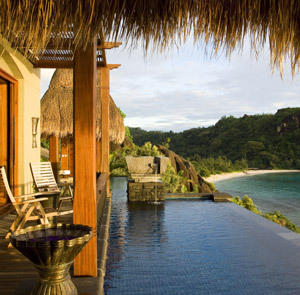 And anyway it’s academic, because Maia Luxury Resort, as it actually exists, is a subtle masterwork by Bill Bensley, the man who’s responsible for quite a lot of what’s currently viewed as the prevailing Southeast Asian and Indian Ocean luxury villa style. It’s an understated influence, and half the art of it is in integrating the villas into their environment. Bensley is a landscape architect as well, and there’s not always a clear line distinguishing these thirty villas, with their private indoor-outdoor space, from their environment. That’s the idea, anyway — the pool feels like some lost lagoon, and the views from the cliffside villas are jaw-dropping. An inventive Asian-Mediterranean-Creole restaurant and a modern spa with open-air pavilions will see to it that you’ll never need venture off Maia’s grounds — and that twenty-four-hour butler service doesn’t hurt either. You can tour the island — or the neighboring islands — by boat or helicopter, and the array of water sports is quite comprehensive. Best of all it’s relatively accessible — though in its immediate situation it feels like the edge of the world, Maia’s Mahé island location means it’s only an airport transfer away. 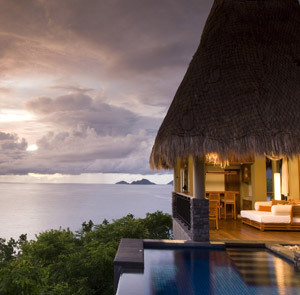 Maia Luxury Resort and Spa is located 16km (25 min from the Seychelles International Airport. Transfers can be organized for €80 per way. Please contact CustomerService@TabletHotels.com for assistance with airport transfers.